Seo Blog Blogger Template is the best SEO optimized blogger template available in 2017. Seo blog is one of our finest creation and made with perfection keeping only one thing in mind and that is SEO. This template is perfect choice for Tech bloggers, lifestyle and News bloggers, Niche Blogs, a business or personal. From Fashion, to Travel, to Food, this multipurpose template will fit any blog niche. it has a clean and simple layout design crafted with perfectly optimized coding. with lots of pre-installed widgets Seo Blog boost your blog traffic and generates quality organic traffic your content so that you can take your blog upto next level. 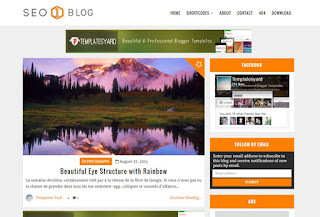 Seo Blog is the most efficient and well coded blogger template, we have made till now. Whether its a loading speed, SEO results, Schema Markup Validation or Responsiveness, It has the capability to achieve higher in any standards and will always get highest scores.